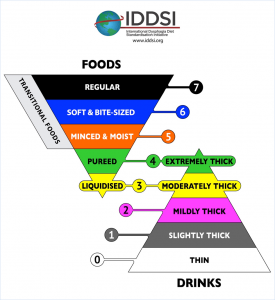 IDDSI Launching in United States- May 2019 - Medtrition, Inc.
Last month it was announced at the 2018 Food and Nutrition Expo and Conference that IDDSI would begin implementation in the USA starting in May of 2019. To develop a standardized way of naming and describing texture modified foods and thickened liquids for people with dysphagia across the lifespan. IDDSI is intended to be person-focused, rather than profession focused. We seek to develop a global terminology that will ‘work’ for all cultures and that will be accompanied by practical and valid measurement techniques that will facilitate use by persons with dysphagia, caregivers, clinicians, food service professionals and industry partners. To seek a common language that can be used for technical, cultural, professional and non-professional uses. We believe this should be a living document, changing as needs change. While the exact implementation plan has yet to be announced in the United States, we know that the push will start in May, 2019. It is important for us to become educated on how these changes will impact industry, clinicians and most importantly our patient populations. While we await the exact timeline, familiarizing ourselves with the information will help assist in a smooth transition. The IDDSI website has created and organized a vast library of resources for us to start this process. If you found this post useful why not subscribe to our blog and be the first to know about product launches and important information that can help you in your facility. This entry was posted in Blog on November 25, 2018 by Karen Sudders.